Aquaculture dates back thousands of years, but has only recently become an essential part of our global food system. However, most of the world's wild fisheries are already fished at their maximum sustainable yield, so aquaculture will have to be the primary source of our seafood now and into the future. This means that we need to understand how to farm fish and shellfish sustainably. We do not have broad-scale understanding today about the ecological limits and potential of cultivating seafood in the oceans. 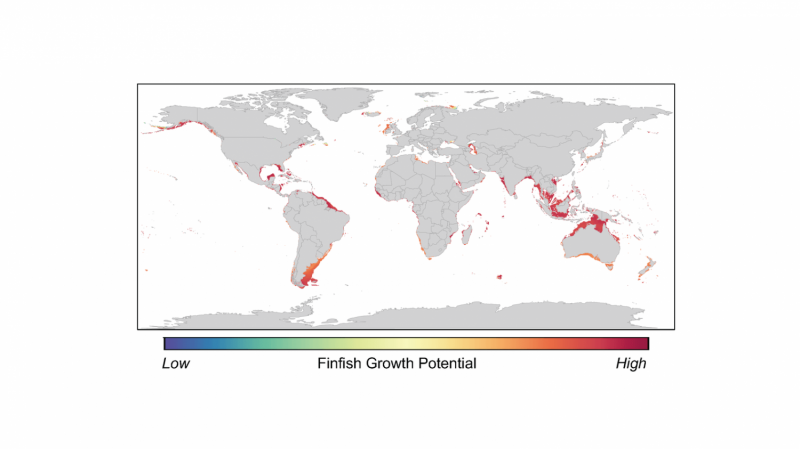 As a first step, we recently published a study that estimated the offshore potential for aquaculture in marine waters, based on the growth performance of 180 farmed fish and shellfish species. We calculated that marine aquaculture could produce as much seafood as all of the world's wild marine fisheries, using less than 0.015 percent of the space in the world's oceans. Total global wild catches have remained relatively unchanged for the past two decades. In 2015, 92 million tons of wild species were harvested worldwide – the same amount as in 1995. In contrast, seafood production from aquaculture increased from 24 million tons to 77 million tons during the same time period, and is still rising to help meet growing demand. In fact, it's estimated that the world will need around 40 million more tons of seafood as soon as 2030. Interestingly, some of our previous research shows that people in developed countries such as the United States – the world's second-largest seafood consuming country, after China – tend to have more negative sentiment towards aquaculture than people in developing countries. This is especially true for offshore aquaculture in the open ocean. After two years of analysis by our expert working group, we found that 3 percent of the world's oceans appears very suitable for marine aquaculture. This may sound small, but it is actually an extraordinary amount of area, spread across nearly every coastal country in the world – about four million square miles. Moreover, we don't even need to use that entire area to meet world seafood demand. If aquaculture were developed in only the most productive areas, the oceans could theoretically produce the same amount of seafood that is currently caught by all of the world's wild-caught fisheries, using less than 0.015 percent of the total ocean surface – a combined area the size of Lake Michigan. This is possible because many aquatic species can be farmed very efficiently, and because farming in the oceans can spread in three dimensions, across the surface of the ocean and downward below the waves. Our study has provided some of the initial science for exploring sustainable marine aquaculture's role in the future of food production, while also considering key conservation goals on land and in the water. To expand on this work, we recently founded the Conservation Aquaculture Research Team (CART) at the University of California, Santa Barbara's National Center for Ecological Analysis and Synthesis. Our future work will explore how climate change could impact aquaculture, and how aquaculture may impact people and nature compared to other food production systems. We know that aquaculture will grow in the coming decades, but where and how this growth will happen depends on good governance, sustainable investment and rock-solid science. We hope to help guide aquaculture's growth in a way that will feed a hungry world while also protecting our oceans. Can offshore fish farming feed a hungry world?